Michael Mosbey sent us a link to a website that attempts to scare people into purchasing a credit report. 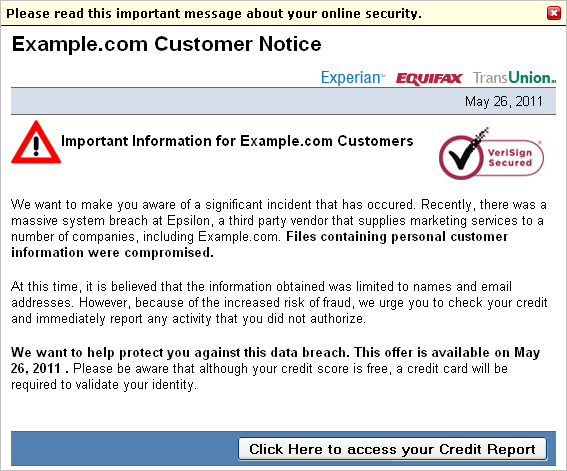 The website, pictured below, reminds the visitor of the relatively recent Epsilon data breach. The goal is to persuade the person into proceeding to another site that is being promoted. This looks like a technique to make money through affiliate marketing. The page is written to assist the attacker in targeting multiple domains. It accepts the targeted organization's name as the "target" parameter. For the screenshot above, we used "example.com", so the page stated "Important Information for Example.com Customers." "2011 All right reserved. This site is not sponsored by or affiliated with Example.com. Example.com has not authored, participated in, or in any way reviewed this advertisement or authorized it. Terms and conditions apply, see service providers's site for details. This site is an advertisement. This website, and any page on the website, is based loosely off true stories, and is a fictitious account. Compensation is received for clicks on or purchase of products featured on this site.. For information about the Epsilon system breach, please click here." 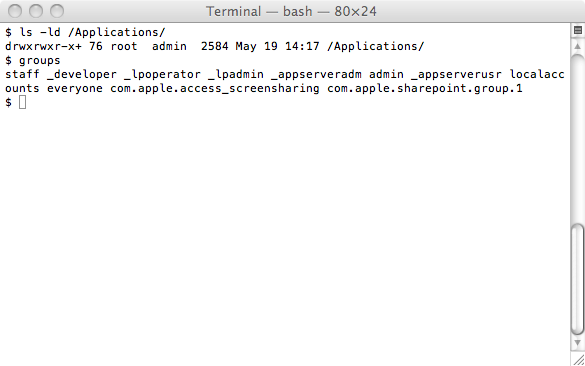 MacDefender, malware posing as security software that targets Mac OS X, and to which only days ago Apple had responded with instructions and a promise of an OS X update to eradicate the threat, has upped the ante with a new version according to Intego that does not need to ask the user's password any longer. So they do not need to use the graphical sudo functionality as long as you're in the admin group (something administrator accounts are). Not typing your password when you did not ask for software to be installed was one of those simple rules to explain to the users, guess we're now down to those much harder to explain instructions for our users.